Now we that we have a radio on our desk next thing you will ask is "Hmmmm ,well I turn it on ,but I don't hear anything ! What's up with this piece of junk I just bought?" I can tell you that with most radios the whip will be quite good if you live on the East Coast for hearing European stations and some Africans as well during good propagation.However to hear those Pacific stations , low powered tropical band guys such as Indonesia, South America, Africans or if you live on the West Coast a,nd can't hear Europe that well, if at all ,then we are going to have to build an antenna to pull in those weak fluttery signals. "Well hell" you say " I just wanted to hear something without a lot of work and I don't know a damn thing about antennas." Well guys, this is going to be one of the easiest ways to get one up and going. Here is what we will need. 1.A roll of speaker wire -can be 25 ft ,50 , or 100 ft roll. doesn't matter. 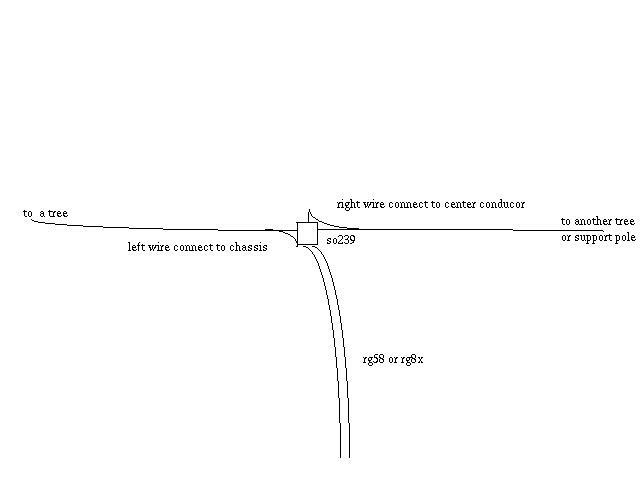 3.Now this is the tricky part.Depending on your radio it may or may not have an antenna jack on it.If it does and you want to spend some extra money and make a good antenna setup that will last as long as the wire stays in the air then go out and buy some RG58 50 ohm coax. If it doesn't have a jack then we will be feeding the wire antenna directly to the whip antenna. 3.Several insulators preferably ceramic but can be plastic as well. 4.Enough rope to use to tie down the antenna wires to a tree or pole or house . 5. A tube of that silicone sealant you see at the hardware store. _optional but recommmended. 6. so-239 chassis mount. This will have 4 tiny mount holes on each corner and what looks like a very small point on end on other side will have threaded jack for a pl259 on most coax fittings. Now find a spot that DOES NOT have any powerlines nearby. Separate that speaker wire down the middle so you have two equal lengths. take one piece and tie the end off onto an insulator. Do the same with the other piece if you bought the coax. If you did not buy the coax here is where two different antennas are going to be described. For those without the coax do this: take the one speaker wire that has an insulator on it and tie the other end of that wire to the second insulator. Attach your rope to both ends.Now on the end of the wire that will be closest to your house carefully strip off some insulation on that speaker wire insulated on both ends and attach one stripped off end of the second hunk of wire to that. Seal that connection with either a lot of electrical tape or squirt the crap out of it with the silicone sealant then wrap tape around that as well when dry. The antenna we are putting together here is an inverted L which will work pretty nicely for you. Tie your antenna off to the highest point you can find and raise it with the rope and tie that to something that won't come loose. Run that length of wire from the antenna we just strung up in the trees and take inside the house and attach to the whip antenna.During lightning storms take that wire off and throw outside on the ground so you don't fry your radio 's front end transistors or blow up a tube. Now if you weren't counting the pennies and wanted a bit better antenna feeding to the radio or you have an antenna jack on that radio you just bought this is your part of the page you want to look at. We left off with one of the seperated sections tied to an insulator.Now take the second piece of speaker wire and do the same thing with the second insulator. Here is a very simple formula for finding a good antenna length for you.This all depends on how much room you have to put up an antenna though. Get out your calculator and divide 468 by the frequency in MHZ (Megahertz ) that you want to listen to. Anything above that frequency will be easily heard while stations below that frequency may not be as strong .It all depends on how high the antenna is and the direction it is facing but it will be better than nothing believe me :) So say you want to hear stations in the 6 mhz band or thereabouts say the BBC on 6175. 468\6 equals 78 so the dipole needs to be 78 ft long from end to end.That means two sections of that speaker wire cut to 39 feet in length. See? Now wasn't that simple? But I don't have 80 feet or more to throw this thing up with you say? OK here is where we cheat then.With whatever room you do have figure that out then go find some wood dowels about a 1\2 inch thick or even better some pvc pipe the same thickness. Drill a hole on each end.Wrap the wire that won't fit in a straight antenna run on these two forms equally ,run each end of that wrapped wire thru the two holes you drilled to connect to the rest of the dipole close to the center and wala we just made a coil :)For spiffiness as well as ease of not having that wire wrapping come undone you can tape that dowel or pvc tubing with eletrical tape or even better yet tie the ends of the wrapped wire off at each hole and then connect the rest of the dipole to those coils by soldering or tying very securely . This will be even better for those of us on small lots than the shorter antennas as now our antenna actually has the electrical length to hear those stations in the lower bands. With one end of the wire , thread the wire through a chassis mount hole on the so239 and tie off securely ,making sure there is no bare wire touching the chassis,then thread that end through the center conductor of the so239.Soldering the wire once it's in the center conductor will help maintain a good connection. Now do the same thing with the other length of the speaker wire to the chassis mount holeand repeat the sealing steps.MAKE sure that you have both speaker wires NOT touching each other or the center conductor wire crossed with the chassis mount wire . After all this is said and done you should have this set up with one length of speaker wire from the center conductor of the s0239 to an insulator on the end and the same with the other speaker wire only it's attached to the chassis mount . This is what we call a dipole.Now pick some trees to tie off the antenna to and run MAKE SURE there ARE NO powerlines nearby.Run the coax into your house. NOW all we need is to figure out what kind of antenna jack ya got on that radio.Most smaller paperback portables will use what we call a 1\8 inch miniplug, or what you may think of as a walkman headphone sized plug . These are the two conductor plugs that can be found at Radio Shack.If you have the coax version the antenna get the f to miniplug adaptor,if you did the inverted L and have an antenna jack you can get 2 miniplugs for about $1.50. Some larger portables will also use a miniplug but some others will use what we call an RCA plug ,,which if you remember ,the stereos back in the late 70's and early 80's used a lot of these plugs .It will look like a center ring outside a hole. Find this at Radio Shack too :)If you have the coax version you can find an adaptor from the F to RCA at Radio Shack.If you did the wire lead in get the RCA plugs that come in packages of 2 I think for about $2.00. Some of the larger radios such as the tabletops will have what we call an SO-239 which looks like a giant threaded jack with a nice big hole in the center.Radio Shack will be happy to toss a couple of these jacks your way in assorted styles. They have both solder versions which you need to know how to solder to coax ends ,or they are nice enough to carry the slipon kinds that need no soldering :)Use this if you did the coax run to the house and have that antenna jack on your radio. For those of us who bought an older radio which had the screw terminals on the back just do this leave that coax bare and run the center conductor to antenna number 1 terminal and the shield to the ground ,and jumper the unused terminal to the ground ,if I remember right. WORD OF CAUTION TO ALL LISTENERS!!!!!! UNPLUG the antenna during lightning storms to save you ,your house and your radio from a strike.Stick the coax in a glass jar or something away from your radio. OOPS almost forgot. UMMM ,well boy ,do I look stupid. This will help out quite a bit in reception and also can be a safety factor in maintaining outdoor antennas. What we need is an eight foot copper ground rod and the thickest wire you can find preferably #6 gauge or better. Find a spot near your entry point to your house where you ran in the wire or coax. MAKE SURE there are no underground utility lines or water lines going thru this place. Pound the crap outta that rod till you get to the 2 inch mark being above the ground.Note that large buckets of water or a water hose can help if ground is being a bit hard to deal with. Now if you just ran the wire out to the antenna get a second wire (if you have a small portable radio just use some thick speaker wire for this) to run to the ground rod. Run this wire from either the antenna plugs ground lug on the rca or mini 1\8 jack (usually the longest terminal on the plug) or if you have the tabletop radio with the large so 230 fitting there should be a ground connection on the back. If there is no ground connection on the tabletop run the ground wire from a screw holding the case on. If you have a small portable radio with just a whip antenna you can attach this wire to the whip.Not sure how well this will work as all my radios have antenna jacks ,but I think it would be better than nothing to drain static.Take the wire you are using and run it out to the ground rod and clamp it tightly. Also there may be some of us that don't HAVE a big yard or even worse live in a spot where no way can be found to string up a dipole .Maybe just have no trees. Maybe we got a wife or girlfriend who screams when she realises what you want to do is have even more wires running around in the backyard :) Here is one that seems to work and takes very little stuff to do.It's so simple even my kitty can do it in his sleep. Best of all it can make the difference between not able to enjoy the hobby and selling the radio because we can't have huge antenna arrays out in the 5 foot yard or keeping the radio and getting some tons o fun out of it. Go to the hardware store and buy two or three sections of aluminum tubing in decreasing diameters from 3\4 inch to 5\8 inch, the last should be 1\2 inch. Run these inside each other about two to four inchs, and securely screw together using some metal screws.You can also reinforce this with little pieces of pvc pipe bolted to each joint. Depending on the length of pipe or conduit you bought this should be at least 20 feet tall. Find an old plastic plate of some sort.One of those 5 cent jobs at Goodwill would work .Yes I mean a plastic dinner plate.Get enough rope for three runs off this pole to the ground,,set it upright on the plate and tie off as in guying it to the ground so it stays upright. Use wood stakes or tent stake on each rope to hold it upright and make sure where you tied the rope is to the 3\4 mark up the pole.The dinner plate is going to act as an insulator for the main antenna from the ground so it doesn't ground out on us and become suddenly deaf. Kinda like shorting out that speaker wire on your stereo. If you just set the metal mast on the ground it becomes grounded and while it may still work the results won't be near as good. Get 3 copper wires about 10 feet long each or more and lay them out in a straight line from the mast in 3 different directions.. Now what we are doing is a vertical groundplane which may or may not be the best antenna but least it works and it is cheap if you find the aluminum or equivalent laying around doing nothing.even tv mast pipe works for this. Run the coax out to this pipe make sure it is stripped off at the end like we mentioned before.Securely clamp the center conductor of the coax to the mast bottom right at the plate area and tie off those 10 ft copper wires to the shield and spread them out or bury them if you can. We need to make sure the center conductor and shield is not touching or this won't work . You may find to keep the two from coming in contact is to make sure the conductor center is securely taped off after clamping so the bare wire doesn't touch anything but that metal piping. Now to waterproof this thing get that silicone sealant and just squirt the crap out of it once you have the coax connected to the active vertical element of the antenna and the ground wires aand then wrap it all up nicely with some waterproof tape or a ton of electrical tape. You are probably saying "Oh yeah right like this piece of crap is actually gonna work GET REAL !!!" Well to answer your question politely ,yeppers it will . I did this at my old apartment, and stuck it on the roof and was hearing tons of European stations,South Pacific and Asians as well as some East Africans on the 5 mhz band in early 1993. The only limitation is that some power line noise if you have powerlines nearby may be heard thru the antenna ,but then also that reminds me make sure this is somewhere where if it gets knocked over or falls when you are raising it it doesn't come in contact with that power line, or else our shortwave listening is over before it even got started. This is a great alternative to listening on a whip and since I last moved I went out and bought me an old CB antenna made out of aluminum and with a tuner I hear just about anything I want with it. Tuners are a different story and will come back to that at a later time. If all alse fails try it out you may be surprised by the results.Then again if you have all the room for a dipole this still may make a great second antenna. If the above vertical is a bit unmanageable,here is a second one to try. Use three wires. 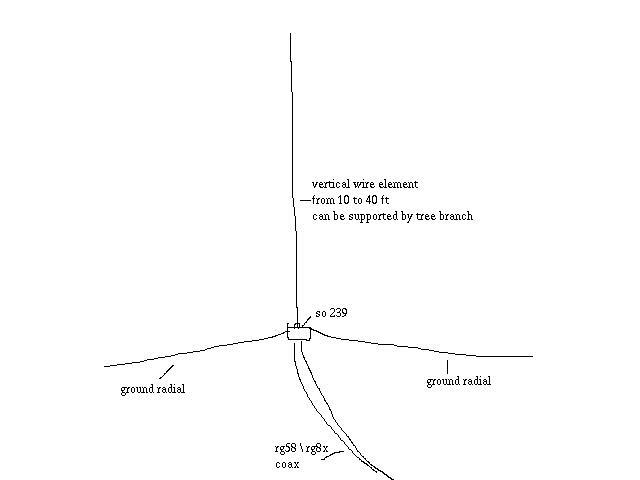 Attach one wire ,however long you are able to raise to a tree branch,to the center conductor of the so239. Attach two wires each to the chassis mount holes of the so239 and ,these two wires can be in the air or buried ,whichever is easiest. Attach your coax to the so239 and raise the vertical element as high as you can get it . Use an insulator to tie off the top of the vertical element to rope so you can raise this up. WHEW I think that should do it. However if I left anything out I'm sure someone will tell me. If you have any questions please don't hesitate to ask, I want you to enjoy this hobby as much if not more than I have these past 9 years For any questions please email me .I am on this rinky dink pc just about everyday and will return all emails on this topic without a major delay. Well barring catastrophic computer failure or death I will that is. PSSST! WANT TO SEE SOME RECENT LOGGINGS AND HEAR SOME KEWL STUFF? Click on the eye to check the logs and listen to some audio files from my radios .